Dozens of dead seabirds washed up on beaches with no obvious cause of death, like oiling, are often referred to as ‘wrecks’. They have been known for centuries, and sometimes the birds even fly long distances inland before they die. Wrecks are usually caused by stormy weather. As storm after storm battered the west coast of Britain and France this year, I wondered whether we might see a wreck of seabirds. And we have. Today, I heard that about 25,000 dead seabirds— mainly Atlantic Puffins, but also Common Guillemots [Common Murres] and Razorbills—have been found on France’s Atlantic coast, the Channel Islands, and Wales (see news here, here, here, and here). Estimating the numbers of birds killed during wrecks is difficult, usually involving counts of dead birds on stretches of coastline, and then some extrapolation. But only a proportion of the birds that die at sea get washed up, so the true numbers killed by storms are higher, probably MUCH higher. Persistent bad weather clearly makes it difficult for seabirds to forage, probably because rough seas cause fish shoals to disperse. Most birds found during wrecks are underweight and appear to have starved to death. Stormy conditions must also impose additional metabolic costs on the birds, to keep warm and fight currents and winds (Blake 1984). The last two major wrecks in the UK occurred in the autumn of 1969 in the southern Irish Sea and in February 1983 on the east coast of Britain. The 1969 wreck (Holdgate 1971) resulted in the death of at least 12,000 birds, mainly guillemots [referred to as murres in the Americas]. The effect of that wreck was apparent the following summer when counts on Skomer, an island off the southwest coast of Wales, revealed a large drop in the breeding population. 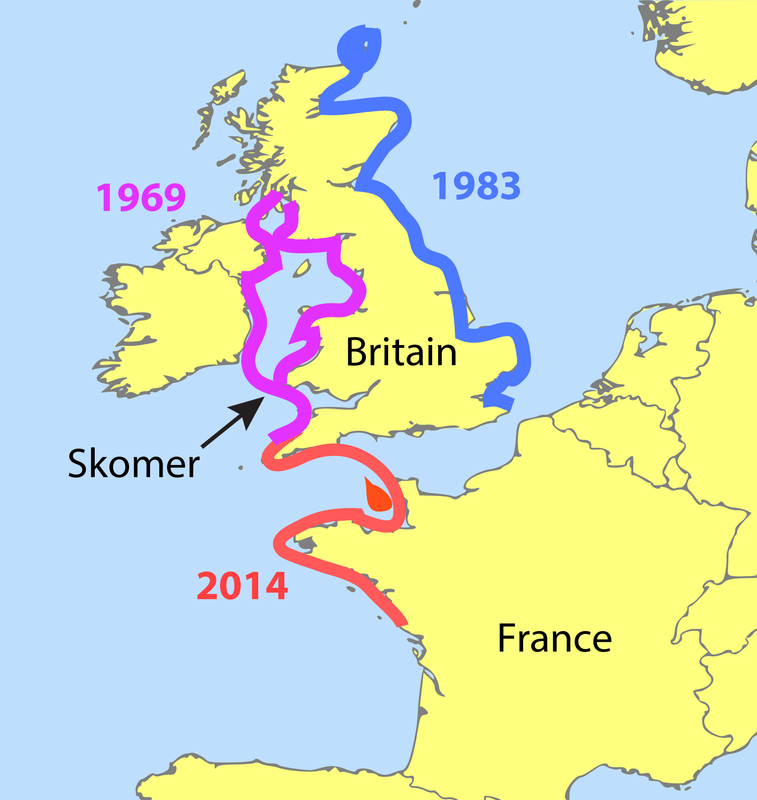 Counts of breeding Common Guillemots started on Skomer in the early 1960s; indeed, this was the first location to initiate such annual counts and they proved their value for they demonstrated the number of birds lost as a result on the 1969 wreck. The counts continue to this day and are part of the important business of monitoring. The 1969 wreck pushed the already-declining Skomer guillemot population to its lowest recorded level, to about 2000 pairs. To put this into perspective: I estimated from old photographs, that there may have been around 100,000 pairs of guillemots on Skomer in the 1930s, so the decline was immense, and the effect of the 1969 wreck almost catastrophic. During the 1960s there was widespread concern about toxic chemicals, and it was thought that some kind of poisoning might have been responsible for the wreck, not least because there was no sign of any other mortality factor. 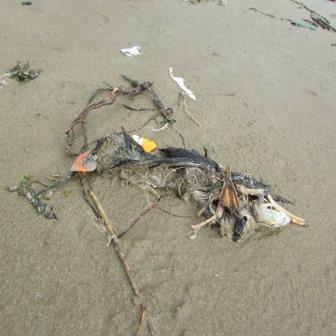 The 1960s was also a time of widespread oil pollution killing seabirds (Votier et al. 2005), but those involved in the Irish seabirds wreck were not victims of oil. The birds were underweight, and chemical analysis revealed high levels of PCBs, so it was thought that PCB poisoning might have been the cause of the mortality (Holdgate 1971). With hindsight it became clear that the wreck was the result of bad weather disrupting feeding, and the birds had starved. The birds had metabolized all their body reserves and in doing so had released PCBs stored in their body fat. The wreck in February 1983, also followed a period of stormy weather, and resulted in 34,000 dead seabirds (31,600 auks, including 10,000 dead guillemots and 18,000 razorbills and 1600 puffins (Underwood & Stowe 1984). This was the largest wreck of auks so far in the UK. The current wreck also seems to be due to the persistent westerly storms during the early part of 2014. The English Channel and the sea off northern France are all important wintering areas for guillemots – based on what we know from ringing [banding] recoveries (Votier et al. 2008). Razorbills winter in the same areas as guillemots, as far as we know, but puffins are renowned for wintering across the north Atlantic. The birds found dead will be from various breeding colonies, but it seems certain that it will include guillemots from Skomer. 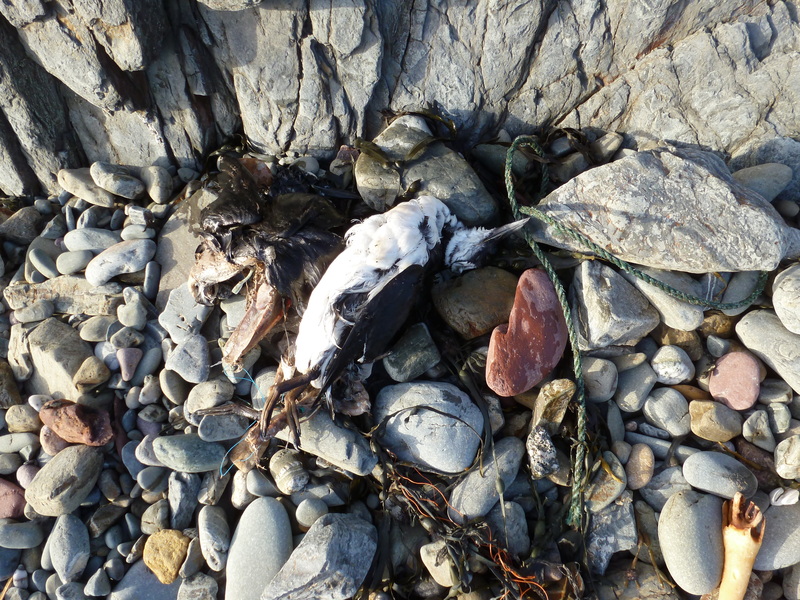 Puffins seem to be the main victims of the 2014 wreck with several thousand found dead so far. It seems likely that many of the birds killed in this wreck will be from the Skomer breeding colony. The origins of these birds will undoubtedly be confirmed when we start to get ringing recoveries. Indeed, we have several already, three puffins, one razorbill and one guillemot all bearing a GLS tags, and all from Skomer Island. Given the relatively small number of auks bearing GLS devices on Skomer, this is an alarmingly high proportion. 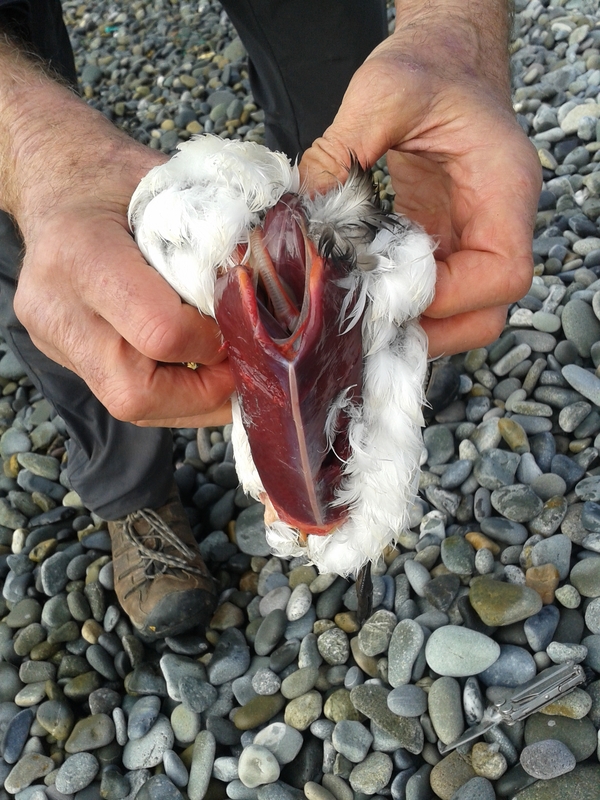 We don’t yet know whether there have been ringing [banding] recoveries of birds from other breeding colonies. The effects of this wreck on the Skomer seabird populations will also be confirmed during our monitoring programme in 2014 – providing we obtain the funding to carry it out. Since 1972 I have been monitoring the population biology of guillemots on Skomer (and since the mid-1980s I have done this in collaboration with my colleague Professor Ben Hatchwell at Sheffield University). Long-term studies are essential when birds are long-lived and guillemots are just that—wrecks apart, typically living 20-30 years. Since the 1960s successive island wardens have counted the total number of guillemots on the Skomer cliffs each year, and my group has monitored guillemot adult and immature survival, breeding success, timing of breeding and the chick’s diet. Such monitoring is vital for assessing the health of a population, but also for giving us a picture of the state of the marine environment (Votier et al. 2005; Meade et al 2012). FOLLOWUP: Michael McCarthy writes in THE INDEPENDENT on the seabird wreck and the disastrous funding cuts to research on the Skomer seabirds by Natural Resources Wales. Holdgate, M. W. 1969. The Seabird Wreck of 1969 in the Irish Sea : a report by the Natural Environment Research Council. London. Meade, J. Hatchwell, B. J., Blanchard, J. L. & T. R. Birkhead, 2012. The population increase of common guillemots Uria aalge on Skomer Isalnd is explained by intrinsic demographic properties. Journal of Avian Biology 43: 1-7. Underwood, L.SA. & Stowe, T. J. 1984. Massive wreck of seabirds in eastern Britain in 1983. Bird Study 31: 79-88.